Susan was born on July 20th, 1957 in Sheboygan WI. From childhood on, Susan found a place in drawing she could go for solace and joy. It is from this place that she paints today. Although she studied fine art at the University of Wisconsin, she felt her studies began in earnest when she met Ron Lukas (now art director at Dream Works Studio) and studied in the Russian impressionist style, learning painting skills in the time-honored tradition- mentor to student. For seven years, Susan studied painting while painting signs and raising their children with her husband, Douglas. Susan continued to hone her skills studying with great artists such as Bill Reese and Del Gish. Susan’s subject matter tends to be inspired by man’s interaction with nature and the capturing of special archetypal moments in time. Many times hints of the human element will creep into a landscape: a boat by a pond, or a wheelbarrow in a field. 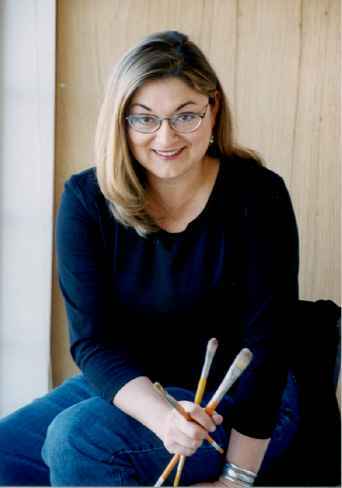 She is keenly interested in color and light, shape and pattern, Susan’s versatility and knowledge allows her to paint whatever she wishes, from still life to landscape to her favorite – figures interacting with their environment.